If you’ve always thought the piazza was invented by Italians, think again. According to historians, it looks like we owe this invention to the Celts. And Milan, which was founded by the Celts, has certainly kept up the tradition. The Celts handed down their history only orally, through rhythmic lyrics and the sound of stringed instruments. All that has obviously been lost, but a written description of their civilization has come to us courtesy of the Romans. Thanks to them we know that the Celts followed an animistic religion, believed that plants had souls, and venerated mostly the elm and the birch. To found a new community, their priests would create a clearing within a forest, and at its center they would plant a sacred elm where the faithful would gather round. From this “magical” place, the people then began to build solid wooden houses and protected them by a belt of intricate thorny shrubbery. For this reason, the cities founded by the Celts have a monocentric circular shape, just like Milan. According to historians, this tradition gradually evolved into today’s “high-energy” squares, with the forest and the shady elm replaced by a church, a town hall, a bar, or a monument surrounded by benches – and chaotic traffic all around. After the barbarians destroyed the magnificent Roman forum, the reconstruction of Milan started from the church squares, and the Celtic tradition of planting there an elm (namely olmo) as a meeting point for the Catholic faithful was revived. Even today, some churches, such as San Pietro all’Olmo in Cornaredo (https://it.wikipedia.org/wiki/San_Pietro_all%27Olmo) in the eastern suburbs of the city, or San Vittore all’Olmo in the Parco Agricolo Sud (http://www.lombardiabeniculturali.it/archivi/soggetti-produttori/ente/MIDB000875/), remind us of this tradition. 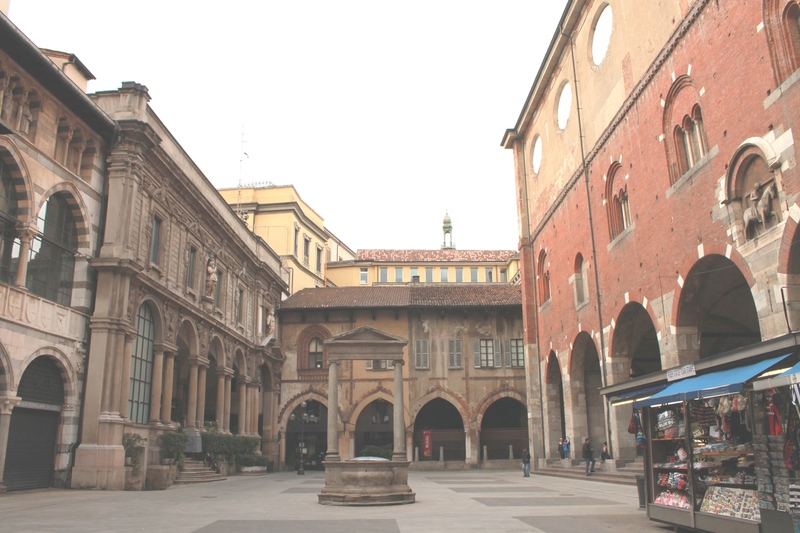 Later on, the medieval city councils understood the social function of wells and fountains and organized the first commercial project around them: the market square (Piazza Mercanti, M1 / M3 Duomo https://it.wikipedia.org/wiki/Piazza_Mercanti). For centuries Milan kept growing, adding new piazzas and wisely balancing religion and secularism. Unlike the Romans, the Milanese neglected the Renaissance renewal and the baroque scenography, preferring to create public areas around a celebratory monument, that often lacked artistical charm. A clear example of this is the monument to Leonardo da Vinci in Piazza della Scala, nicknamed by the witty Milanese “one liter for four,” after the taverns’ custom of serving wine in a big liter bottle (Leonardo, in this case) on a tray surrounded by four smaller glasses (his four disciples)! Eventually, a Milanese artist changed this trend by creating works in bronze and iron worthy of international acclaim. His name is Carlo Ramous, and his life is worth remembering. Born in Milan in 1926, he studied at an art school, then he enrolled at the Polytechnic, while attending the courses of two masters such as Giacomo Manzù and Marino Marini. At the beginning, he used china and charcoal, but soon he switched to a mixed technique, combining metal, wood, fabric, paper, acrylic, enamel and lacquer, harmoniously mixing painting and sculpture. Working with terracotta and plaster, in 1946, he exhibited some early anthropomorphic works at the Angelicum Gallery in Milan, where the jury hailed him as one of the most promising sculptors of his time. Later on in life, he oriented his art towards abstract metal sculptures exclusively. In this regard, his words are clear: “I knew I could not reach the truth, thus I transferred my art research to the language of symbols … I think this kind of expression sometimes has the warm and poignant taste of poetry”. Ramous then began producing large size works using bronze and iron or steel plates, participating in the Venice Biennial (1958, 1962, 1972), the Milan Triennial (1954, 1960, 1964), the São Paulo Biennial of Brazil in 1961 and the Rome Quadriennial (1955, 1959, 1973). 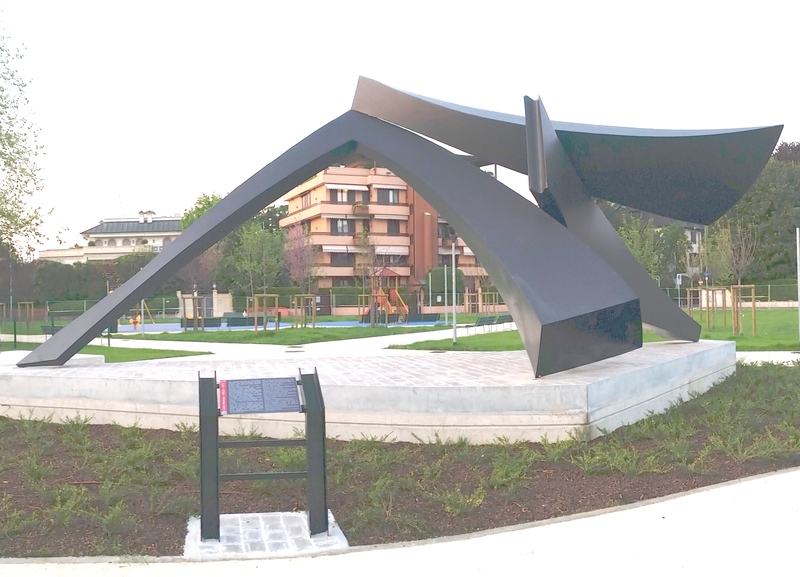 In 1973, at the show “Contemporary Sculptures in Urban Space” in Parma, he exhibited five works in the most significant piazza of the city. But at the end of the exhibition something unexpected happened. Who was supposed to haul those giant sculptures away? And above all, where were they supposed to be stored? Ramous continued to work, and his production reached its peak in 1992 with “Ad Astra”, a gorgeous 12 meter high stainless steel sculpture, placed with honor in Chuo Park in Chiba, Japan. He died in 2003, and his fame faded away. But all wasn’t lost. The Milanese architect, engineer and art buff Walter Patscheider entered the scene. In 2011, after having inherited from his father a large collection of sketches and mock-ups by his friend Ramous, Patscheider followed in his artistic footsteps, until he discovered, after 30 years, the sad fate of the abandoned sculptures in the Parma warehouses. He found them in pitiful conditions, dismembered, rusty, encrusted, damaged. “Timpano” and “Continuity” have been rescued, cleaned, piecedtogether following the original mock-ups, and finally returned to their original beauty. Unfortunately, a fourth work, “Anelito”, is still missing a piece, while a fifth (“Development”) is missing altogether. Currently the works of Ramous are exhibited in some of the major museums and urban spaces all over the world, including some squares of Milan. Walter Patscheider is now organizing the exhibition “Carlo Ramous – Shaping the space,” which will take place at Malpensa airport’s Terminal 1 from 27 February to 29 June. Here are the addresses where you can find Ramous’ sculptures in Milan.